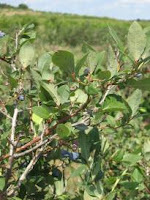 One of the things I look forward to each year is blueberry season. One of my favorite fruits ever, the blueberry is one I chase down at the Farmer's Market almost relentlessly. In the past, our freezer fills with containers and our granola overflows with them. Since I learned to can last year, my plan is to not freeze so many but to can them up in various forms. Freezing is easy but energy-intensive for long periods of time. Power outages are not uncommon here so canning seems safer and more logical. A few jars of jam are done up already with berries I picked up last Saturday at the Farmer's Market, and a recent adventure picking at Kapnick Orchards in Tecumseh yielded a nice number of quarts, too. The bushes were nearly overflowing with big, fat berries. The majority made it into our containers, but went straight into our mouths. I'd never had a sun-warmed blueberry in my life, and one of my sincerest hopes is that those I ate that day won't be the last. Those little blue gems were the best. I look forward even more to seeing them on my toast, in my oatmeal, and even on my ice cream.